As investment advisors and counselors, our job/mission/calling is to close the gap — the behavior gap. 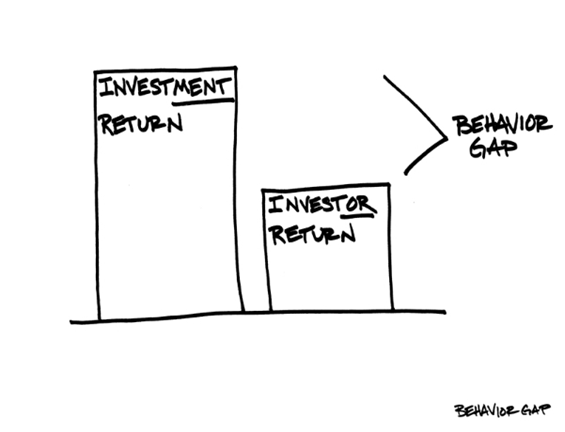 The behavior gap is the reason most investors’ portfolio returns don’t even come close to achieving market returns. Their emotions (such as fear and greed) have them chasing performance — buying high (after prices have already gone up) and selling low (after prices have already gone down). In other words, instead of buying investments after they’ve gone on sale, they buy after they’ve been marked up. As the saying (kind of) goes: This isn’t the way most people buy socks, so this isn’t how they should buy stocks either. As advisors, we need to manage investor expectations and emotions. Easier said than done, but if accomplished, this is how everybody wins. Investors win because they are more likely to reach their financial goals, and advisors win because they have satisfied and loyal clients. Explaining how markets work is the first step. Investors should know that financial markets have a strong positive bias (i.e. they usually go up), but they are volatile and vulnerable to sharp, temporary losses. Second, developing an appropriate portfolio based on an investor’s unique risk tolerance, capacity, and needs and then explaining how it may behave in all market conditions is critical. An investor who understands how her or his portfolio should behave, will not be surprised. Third, investors should have an informed, conservative expectation of future market returns based on factors such as long-term valuations and market history. The key to this last sentence is the word “conservative”. Managing investor emotions can be even more difficult, especially when market volatility is elevated and news flow is urgent and sensational. However, this is where a relationship between an advisor and client is critical. Trust is built through conversations. Discussing goals, risk appetites, experiences, expectations and other unique considerations can build a foundation for tough times —such as when an appropriately built portfolio comes under siege from fear or greed.